Author: Bender, H. Eric, M.D. Three doctors explore and explain the least recommended techniques lurking in the darkest corners of medicine through the ages. 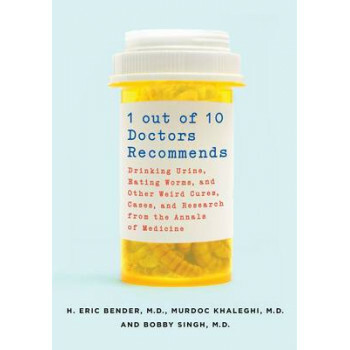 Entertaining and informative, (and sometimes just plain gross), 1 Out of 10 Doctors Recommends examines the strangest and most unusual medical practices, including: drinking your own urine to fight infection, using live eels to relieve constipation, and licking a patient's head to diagnose Cystic Fibrosis. As licensed medical physicians who believe that humour is the best medicine, the authors decode the methods behind the seemingly mad science in these lighthearted mini essays. 3 out of 3 authors recommend that you read it immediately! Kooky, creepy, crazy examples include: Bee venom to treat herpes, intestinal parasites for allergy meds, "Natural" ways to make your genitalia larger, Potato to stop bleeding after delivery, Salt pork for a sore throat, Vampire Facials.